Last night I test drove Kitchen Confidence! 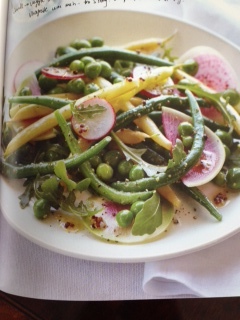 I picked two recipes to make for dinner: Pan Seared Spanish Steaks & Summer Bean, Pea & Radish Salad. I’ll say right up front that the sauce for the steaks was so swoon-worthy, Steve grabbed a leftover hotdog bun (the only bread we had nearby) to sop it up off his plate once the steak was gone. That alone made this attempt worth the effort. And the salad was delicious and helped me overcome my fear of lettuce. I learned to blanch green beans & peas. I wondered: when you chop fresh tarragon, do you include the stems or just the leaves? 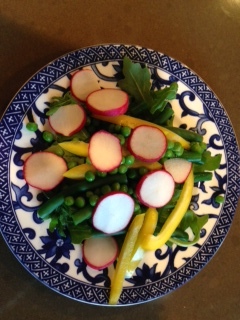 I remembered how much I love radishes –for the taste, but especially for the color. They’re gorgeous. I learned to make a HUGE mess in the kitchen and just not worry about it. There was time for cleanup later. Kitchen Confidence would make a good gift for someone who is in the early stages of learning to cook for a group (family, roommates, etc.) who lives somewhere where the whole low-carb/low-fat thing hasn’t taken hold. Most of the recipes are more work than I would have done when I lived alone, and the portions are for groups of 4 or more. Many of them are super carb-heavy. I LOVE bread, macaroni, cream, etc., but even I was taken aback by how caloric some of these recipes were. This is not a book for dieters! I found her time estimates accurate (even given my lack of culinary acuity and the fact that the first two steps in ANY new recipe I try are “Put hair in ponytail,” and “Pour glass of wine”), and there are several hearty dishes I’ll try when the weather cools off. My recommendation: give it a go! This entry was posted in Books, Uncategorized and tagged Kitchen Confidence on August 6, 2014 by Trish Ryan.